This is Erik Davis‘ account of the interview heard in this podcast. Excerpt: The following are excerpts from interviews that I conducted with Terence McKenna in late October and early November of 1999, in preparation for a profile that appeared in the May 2000 issue of Wired. These interviews have also been edited and released on a CD, Terence McKenna: The Last Interview. Given McKenna’s subsequent demise, I chose selections concerning his feelings about death and dying. The October interview was conducted in San Francisco just a few days before Terence underwent a craniotomy, and he therefore spoke a bit more frankly about his condition than during November, when I spent a week with him and his wonderful girlfriend Christie Silness during his sort-of recovery in Hawaii. Posted in Consciousness, Erik Davis, Future, Psychedelics, Terence McKenna (mp3). 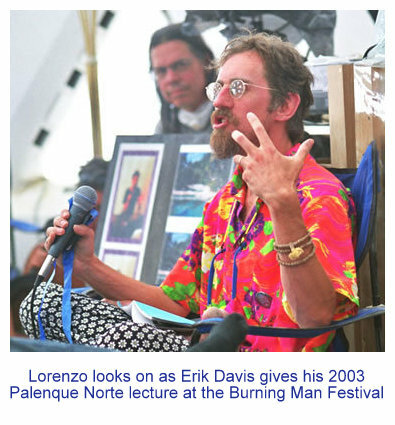 Much love to Lorenzo and Terence Mckenna,and Dennis Mckenna. After, listening to the podcast 262, I would like to send you some quotations written by Paul Brunton, Ph.d. from a book he wrote called, “The Quest of the Overself”, ninth impression. Published by Rider & Company. London : New York : Melbourne : Sydney. is one thing ; to feel it as a living reality, as a divine force, is another. I really like Terence’s quote about what the Angel told Descartes, as a Sacred Geometer, despite not believing in the Christian sense of the word Angel. I love the speculations brought about by this talk, especially the dialogue between the individual and the entire over-mind of human thought and where it could lead (internet). You’re right Lorenzo, we need to keep the internet accessible and free from censorship and omission. Interviews of Terence the person, rather than Terence the compendium of Encyclopedic botanical and experiential knowledge are rare indeed. This is intimate and I cherish this insight. Many Thanks Lorenzo! Thanks for posting this! I’ll have a listen after dinner. Recently John Hazard posted the last video interview (1 hour) with Terence on Reality Sandwich. I haven’t seen it yet, but I’m sure it’s worth it. I agree with Starhive. More information from the feminine perspective would be great. Thanks for posting this! I love both these guys!